Traveling via plane is the only way to get overseas and the fastest way to get across the country. Sadly airplane tragedies, disappearing aircraft and shoot-downs have been in the news recently. More than 700 airline passengers and flight crew have lost their lives in the span of 138 days in 2014 making us feel a little skeptical of flying. While it might seem like the odds are against us, numbers show us that is not the case. Commercial airline deaths has been on the decline for decades with 2013 being the safest year in aviation since 1945. As the years go on, technology advances and equipment improves, making it that much more safe to fly. Albert Goldson, member of the Aviation Owners and Pilots Association (APOA), is a private pilot and in the Global Association of Risk Professionals (GARP). He’s spoken recently on cable TV with respect to the recent airline tragedies in Ukraine, Malaysia and Africa. He notes that while “Overall commercial aviation has become safer each year…the majority of commercial airline crashes have occurred in developing world countries and even some developed ones like Russia and India which have horrific aviation records.” Goldson attributes the crashes in those places due to “Lack of updated airport navigation equipment, poor maintenance of existing equipment ‘ often which are not in operation and lack of training and supervision of technicians maintaining aircraft and airport facilities.” So while you might feel a few bumps at 30,000 feet, rest assured if you are flying in a major U.S. carrier, you should be in good hands. Statistically, you could fly every day for 123,000 years and still be safe. While there is a relatively low chance at crashing on a U.S. commercial jet airline (1 in 7 million), some people understandably still feel uncomfortable. Not to worry. Here are a few tips that you can use to add some additional peace of mind to your next air travel experience. The safest seats are in the rear exit aisle because it’s the furthest from impact and fuel areas. While not ideal for leg room, reclining your seat or getting off the plane quickly, some airlines board from the rear of the aircraft so you’ll have first dibs at overhead bin space in addition to being safe. So use the seat selector to pick the back of the plane. While it’s not first class, these seats are first priority when it comes to safety! Although this tip might sound obvious, especially if you are flying over water, every aircraft is different in terms of where the life vests are located. 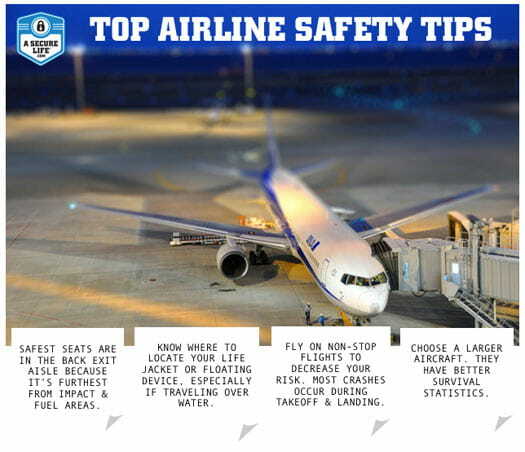 Take a moment to orient yourself with the plane’s equipment and take a quick peek around and under your seat so you’re set should an emergency arise. Most crashes occur during takeoff and landing so the fewer flights you take, the more you reduce your chances of a crash. Statistics show that the larger planes have better survival rates than smaller ones in the case of a crash. While you might not always have a choice when it comes to the aircraft, you can see what type of plane you’ll be flying before booking your ticket to see if you could opt for a bigger plane. Tip: the larger the number of the aircraft type, the larger the plane (ex. 737 is smaller than a 747). And if you need a refresher on in-flight safety tips, check out this hilarious video by Virgin America. But still need more tips? You can read more on passenger safety information on the Federal Aviation Administration website. Traveling is a lot of fun, but only if you don’t fall victim to things like sickness or theft. With travel, unexpected situations can arise. But if you plan ahead and are take precautions for your trip, traveling will be much less worrisome. 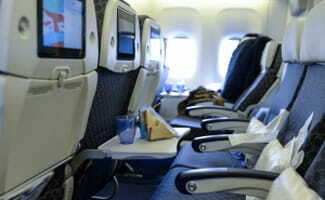 By implementing these easy, yet important, flight travel tips you can be a enjoy a more relaxing vacation. We’ve even summarized them for you in this handy little infographic to print out, Pin or reference often. To embed this infographic on your own website, just copy and paste the code below! So sit back, relax and enjoy the ride! What are your best tips or resources for travel safety?